To enter our February 2018 Release's The Big Giveaway CLICK HERE. 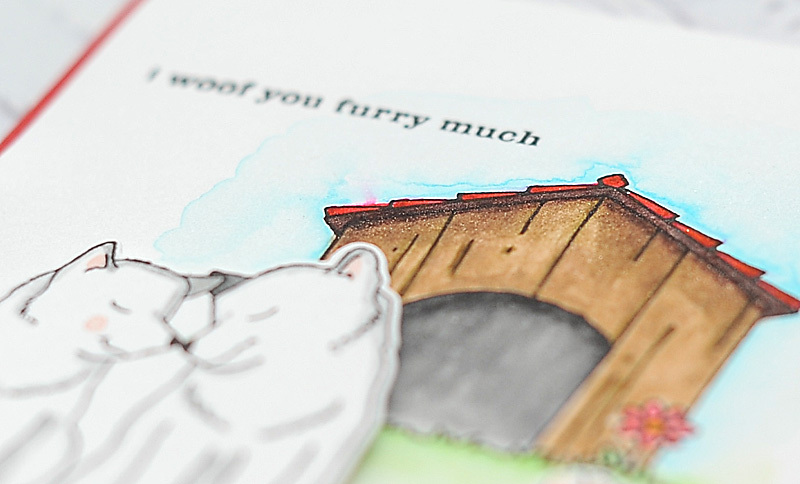 Today Shay is introducing two new critter sets illustrated by the amazing Evelin T Designs. 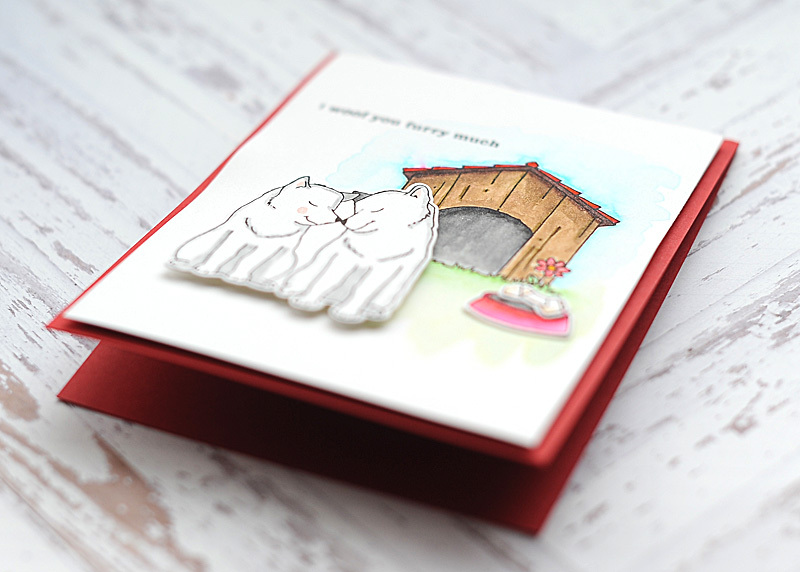 There is a kitty themed set & a doggy themed one...so something for everyone! It's no secret that I'm not much of a critter coloring stamper, but these images were just begging to be colored a bit. 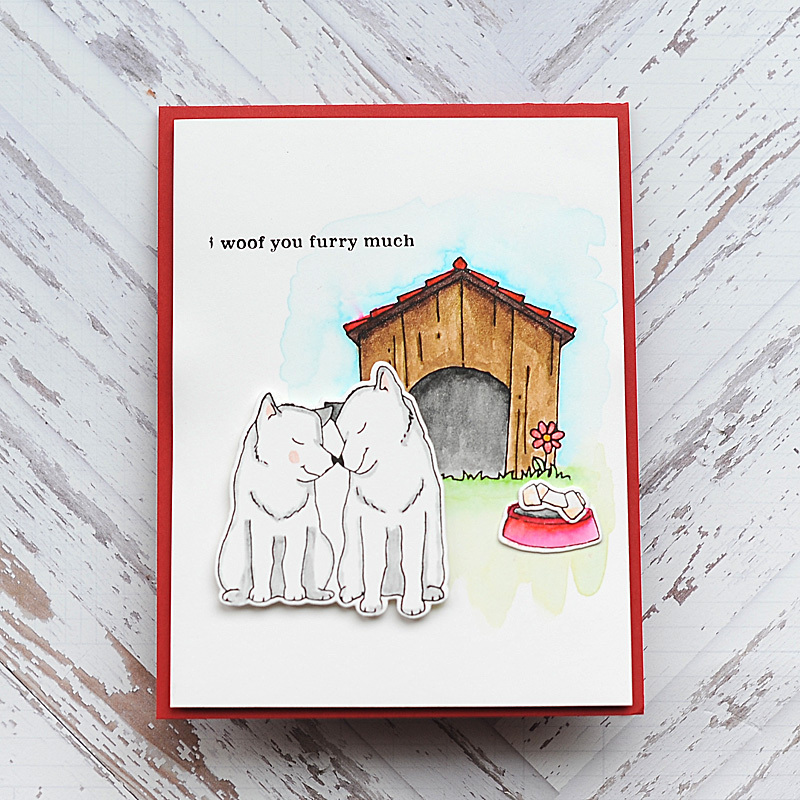 So, I paired the new Dog-Gone Cute stamp & die set with my Zig Clean Color Real Brushes - and I think it worked out. It's simple, but I kind-of love how it looks like a children's book illustration. Here is my card! 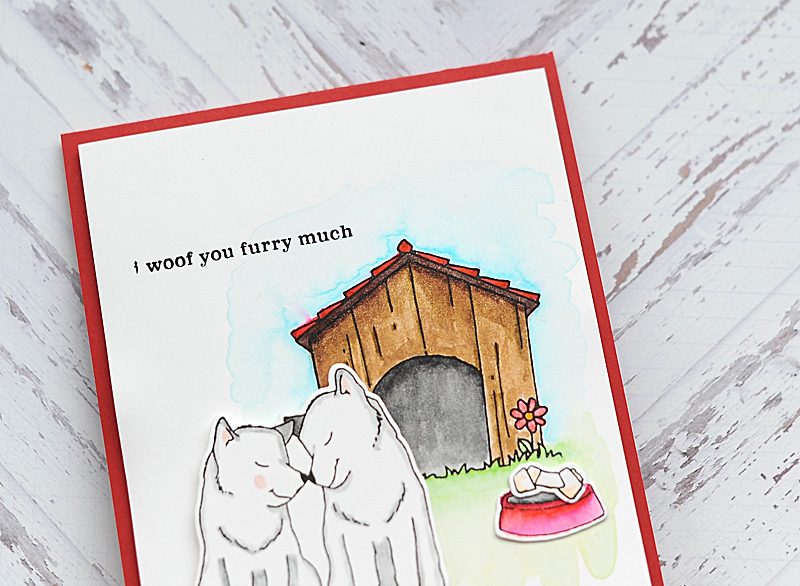 This card was relatively easy to create, and I kept the design super simple. I didn't even add any jewel accents...I swear I must have had a fever. Lol. To start I cut & folded an A2 card from red cardstock, then set it aside. 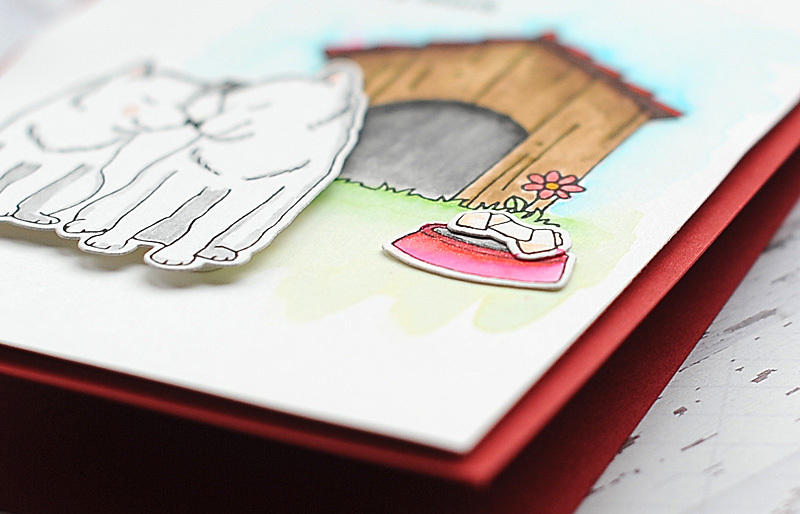 Next I trimmed a white cardstock block slightly smaller, and stamped the doghouse to the front. Then I stamped the dogs, dog bowl & bone to a separate block of white cardstock. The next step was to color each item in. I used my Zig Clean Color Real Brushes & just simply colored each item. I started with light colors & then blended in darker colors here & there. Friends - I am not great at coloring nor do I know the science behind shading, so just keep that in mind as you look these over! :) I brushed around the doghouse with light green & light blue, and then used a watercolor brush to fade it out & add a little bit to the scene. 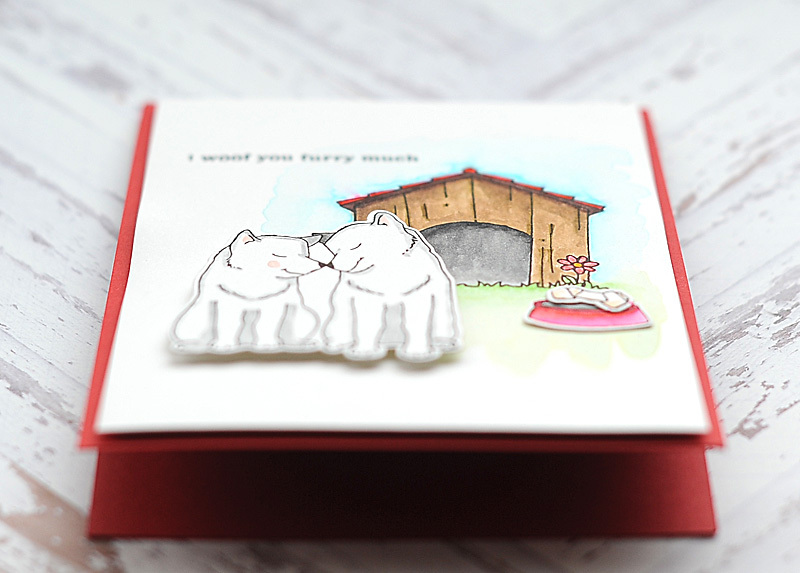 After stamping the sentiment to the front, I adhered the stamped block to the card front using fun foam. 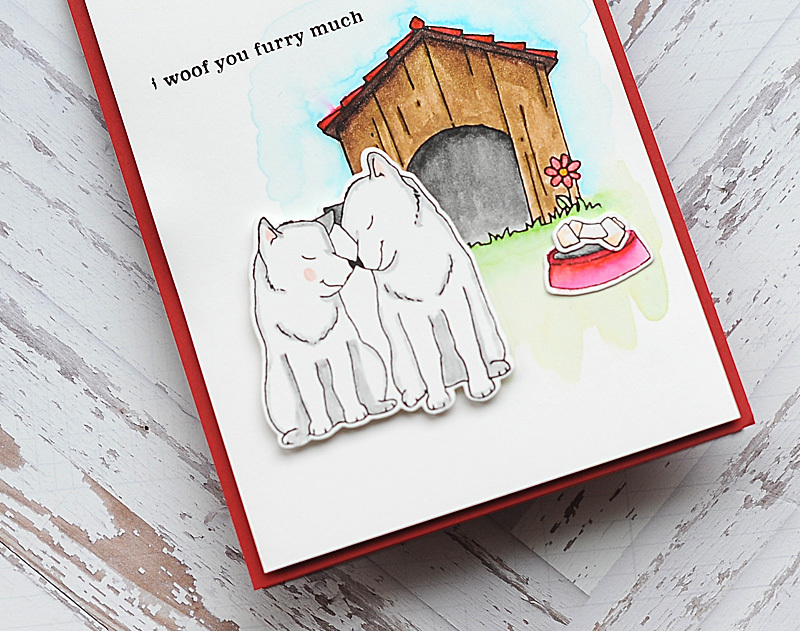 Then I diecut the other stamped images and layered them to the front of the card, popping the dogs up with foam dots. To finish, I added some clear glitter with my Wink of Stella pen here & there to just give it a little something extra. That is my simple little card for the day! I hope you enjoyed it! 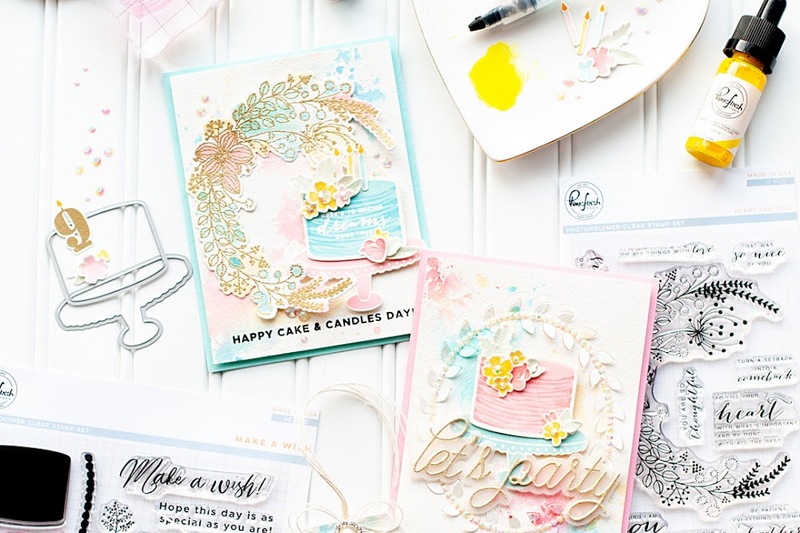 I will be back soon with more Winnie & Walter goodness - including our big 4th Birthday Bash Blog Hop on the 16th. Be sure to mark your calendars! Awe ... what a sweet creation! Thanks so much for playing in our ‘For the One I Love’ challenge at Dies R Us. Remember, you must use at least 1 metal die on your creation to qualify for the prize! Good Luck and please come back again soon! I used 3 dies - I specifically mentioned that they were diecut twice in my blog post. Thanks! Really love this card! Perfect for anyone who loves dogs....which is all of us! Wish you had used even one metal die on it so you could qualify for the prize. Thanks for joining our "For the One I Love" challenge at Dies R Us! Oh how sweet! Love the whole idea of this little love scene, just so different and special. Thanks for joining in with the current challenge at AAA Cards. Ahhhh....puppy love! Your cuddling dogs are so sweet, and I'm especially taken with the way you've left them white and brought pops of colour into the background. 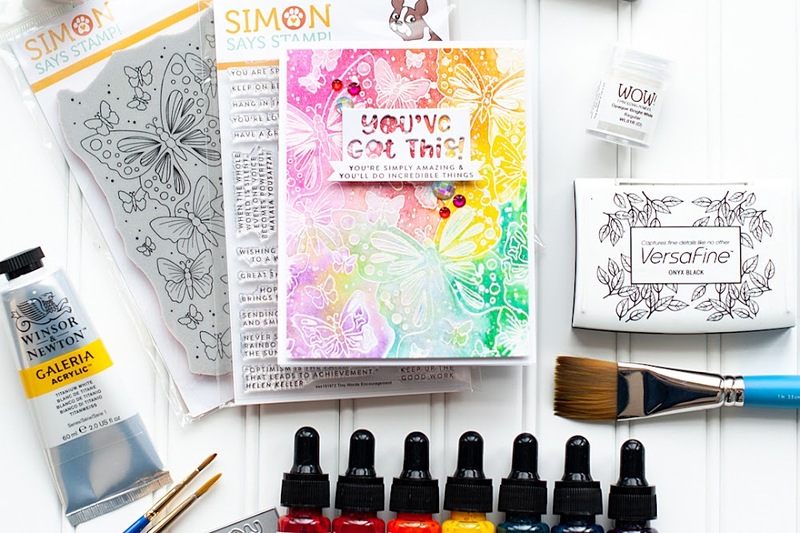 The contrast truly enhances the impact - and gives folks like me, who struggle with colour, some hope to create cards that 'can' be eye-catching despite an absence of lots of colour! Yet again, your eye for design delights! I love the sentiment and the dogs are so sweet. So glad you joined us at Die Cut Divas. 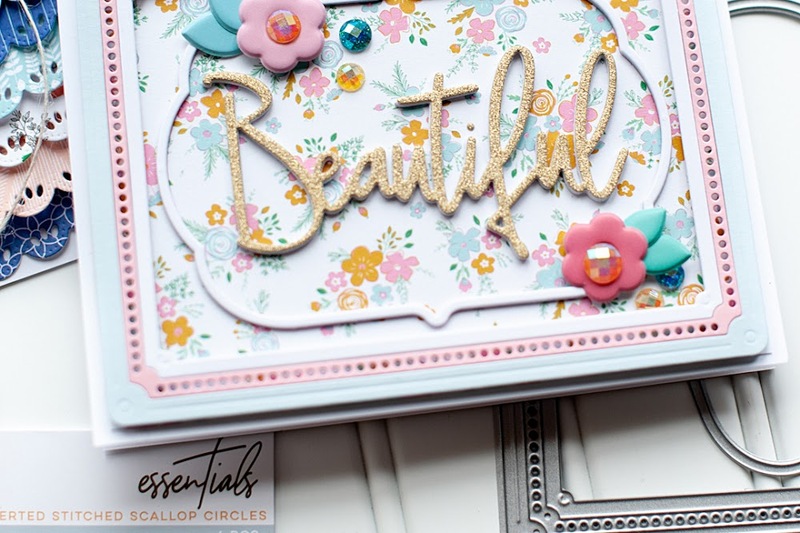 Gorgeous card Lea! The image is so cute and so beautifully coloued. This is so sweet! AND adorable.Thanks for joining us at Dies R Us! Simply adorable and of so cute Lea. Thanks for sharing with us at HLS for our AG with Dies Challenge. Such a sweet card! Thanks for playing along with us at AAA Cards!